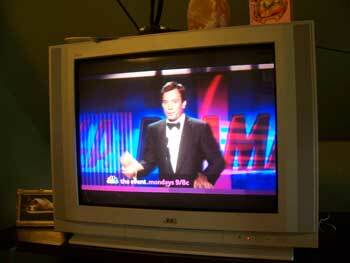 Jimmy Fallon, cutie patootie of my television set, you did a terrific job as host of the Emmy Awards last night (I like your show, too). I’d go so far as to say that Billy Crystal probably thought you looked mahvelous, and that’s saying a lot. What a hoot that was, especially seeing Jimmy’s imitations – he’s good! Not to mention the belly tickling humor, all the touching speeches, and the great opening number. Jon Hamm, let’s be square dance partners some time. You can toss me up in the air. Yes? Okay! Of course, the handsomeness of the tuxedos and the gorgeous gowns made me swoon. And they were mostly good too, pretty and sparkly and fine. Save a few, of course. I don’t think ladies should look like they are draped in blue plastic or are in the process of imitating a Victorian lamp, no, no, no. But who am I to judge, really? If you feel pretty and your boat is afloat, I should keep my lip buttoned. It’s not like I’ve ever had to choose a dress for the world to see. 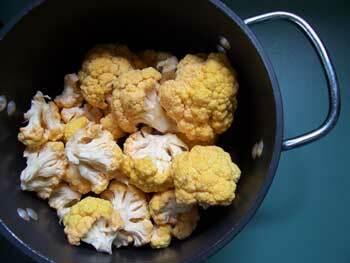 Place the florets in a soup pot (mine is 3 1/2 quarts) and add the stock. Unless your florets come from a very small head of cabbage, the stock won’t cover them all, so don’t fret. Turn the heat to medium-high, and cook, covered, for about 30 minutes, until very soft. 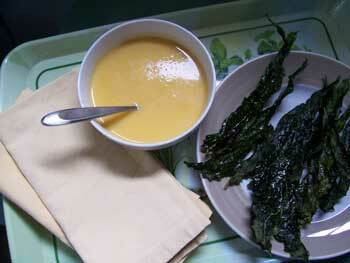 Puree with an immersion blender until smooth – or you could leave some of the floret pieces whole if you like it chunky. Taste and add salt as necessary. Add the cheese, paprika, and cayenne pepper. Stir until cheese is melted and well incorporated, about one minute. Serve. We had ours with the kale, rye crisp and a little butter, but crusty bread would be nice, too. As many of you know, from this space and my life in the physical world, I practice yoga. 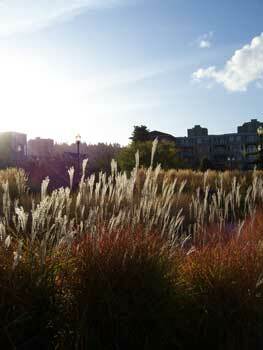 What initially began as neat way to get exercise has become a deeply invigorating physical and spiritual practice. By God’s (or maybe Buddha’s or Shiva Nataraja’s) grace, I have the privilege to be led through asanas that bring me closer to what I believe is most important in this world: body, mind, and spirit connecting and strengthening, not just within me, but to human consciousness, and all that lives, breathes, and moves. As a result, I have changed. I am more integrated, physically stronger yet softer, more understanding, caring, and connected. I still have a long way to go, but the journey, with yoga, is far more joyous and centered. At the center of this is Shiva Rea. I have had other teachers, but none has inspired me or encouraged me to continue as she has (despite never having met!). Were it not for the discovery of the brilliant Yoga Shakti DVD more than five years ago, I don’t know that I would still be practicing. It’s not only Shiva’s way of teaching, of leading, but the steady evolution of her yoga, rooted in the ebb and flow of life, not to mention those fabulous matrices that allow me to mix it up according to my needs and time. These four DVDs are my favorites and are the foundation of my practice. They are challenging, fun, beautiful, and as ever changing as I am. Difficult one day, a breeze the next, they enable me to be exactly where I am and embrace it. As for each video – Yoga Shakti is closest to what I would call a traditional vinyasa practice. I think, too, if you are new to yoga, it is the best place to start, as she offers some basic postures and forms. As you progress, it can be very challenging, too. Even after more than five years, I can, by no means, complete all the postures as shown. Shiva is strong and incredibly flexible! My goal is to have this video mastered in 2013. The body and mind open slowly, over time. 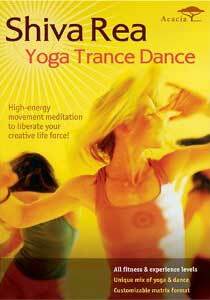 Trance Dance – I’ve written about this before, and my love for it is simple. Dance! Invigorating, fluid, sacred, and totally fun! 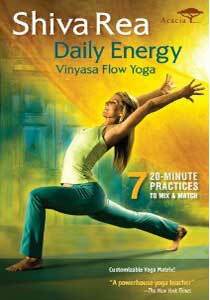 Daily Energy – I was so jazzed when she made this DVD! Sometimes I don’t have a lot of time. With this video, I can have a complete practice in as little as twenty minutes, which is pretty awesome. Since it also has a yoga matrix, I can make it a whole lot longer, add some core work, forward bends, and a complete shavasana, too. Creative Core + Upper Body – Though the practice is centered around 108 push-ups (not all at once – thank goodness! ), it is definitely not just for the upper body. The legs and core get a terrific workout, too. Speaking of the core – in all of the DVDs except Trance, she offers core cultivation in very creative and fun ways. I’d never seen or felt anything like it – very good! Oh, and this one is also pretty short, running at 35 minutes. My friend Kelli, of African Kelli, has just had her first book published, and last night, her very first reading. I can only imagine the butterflies, joy, and magic in Phoenix! A dream come true. This moment is even more special for me because it gives me hope that my book will one day be out there, too. 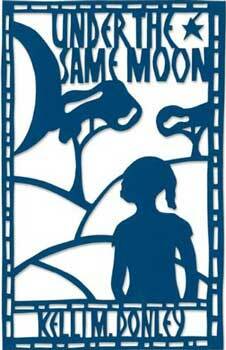 As well, my good friend Colleen designed the cover, and rather beautifully, don’t you think? I am hoping we can all make it a bit sweeter by buying our own copies (mine is on the way). Let’s get her to the top of the Amazon list! Abena Udate was selling mangoes on a humid market day in her Mozambican village when she caught the eye of a wandering foreigner. Kidnapped and brought to live in suburban America, the African teenager struggles with the glaring cultural and social differences of her new life. Abena is expected to play along with her kidnapper’s story — she’s just another hungry child plucked from a desolate country and saved by foreign adoption — or else. As her younger brother Kupela searches for clues to explain her disappearance, Abena must decide whether to remain with a family she doesn’t love for a life of luxury, or find a way home to those she loves in a world of despair. Support an emerging writer – buy it here! I hope the weekend treated you well. Ours was a slice of pie – heavenly and ever so good. The fact that I actually made a pie being the veritable cherry on top of it all, indeed. Our weekend began in earnest on Thursday evening, as my former students and their friends came for dinner, an ever so brief game of gnome bowling (much more boring than anticipated), and lots and lots of top notch conversation. Broken record alert – I am so very proud of these young men! They are unremittingly kind, smart, thoughtful, and funny. I feel ever so lucky to have them in my life. Oh, and Matt, if you’re reading, you were the inspiration for the pie. After talking about it, I just had to have some, though mine is nectarine, not peach. We spent our Saturday with new friends who feel quite old (but not at all elderly). We have so very much in common (crafting, gardening, a love of nature and more) and the conversation was just so easy, the best combination, really. They have a gorgeous place in the country, full of flowers, wildlife, and beautiful vistas, the very place I’ve imagined when I fancy a Cooper-Sohn retreat in the woods. Add to that the fact that we had delicious food, the company of adorable and sweet children, and a fire under the stars, well, you know. It doesn’t get much better. Thank you Twists! Oh, and p.s., if you’d like to see their lovely home and the beautiful things Beth makes, I’ve added the link to their blog – My Heartstring under friends. Yesterday, oh yesterday I spent harvesting lavender. Which sounds much more pedestrian than it was, I assure you. Maybe harvesting isn’t the word I want. Picking? I don’t know. In any case, I spent ten hours (no exaggeration) removing the fragrant spent buds from the stems clipped in our back garden so that I might make some sachets. I never imagined it would be such an undertaking. I watched bad television, four movies, wore holes in the thumbs of a pair of rubber gloves, and felt as sweet and sleepy as Dorothy and the gang in that field full of poppies. Cross your fingers that the end product will be worth all the labor. I will most definitely post pictures if it is. 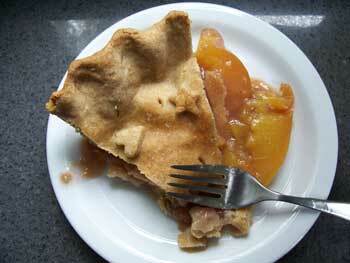 For now, it is a picture of pie, another blissful weekend gone by, and a happy week to come. Let’s enjoy it! Another p.s. – this is post 401! How about them apples?